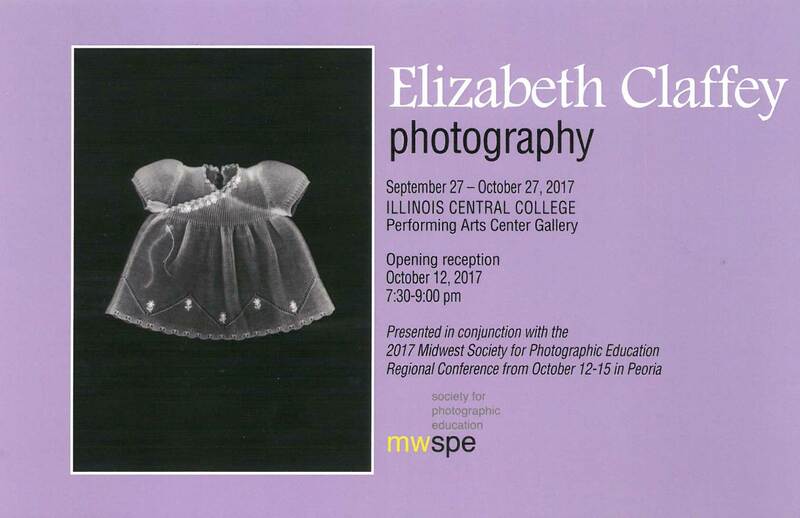 Two photography exhibits open September 27 in the Illinois Central College art galleries, located on the East Peoria Campus. An exhibit of works by Elizabeth Claffey opens in the ICC Performing Arts Center Gallery, located in the lobby of the facility. A reception for Claffey is scheduled for October 12 from 7:30 pm to 9 pm in the gallery. This exhibit is being held in conjunction with the Midwest Society for Photographic Education Regional Conference, and will be open for four days in Peoria starting October 12. 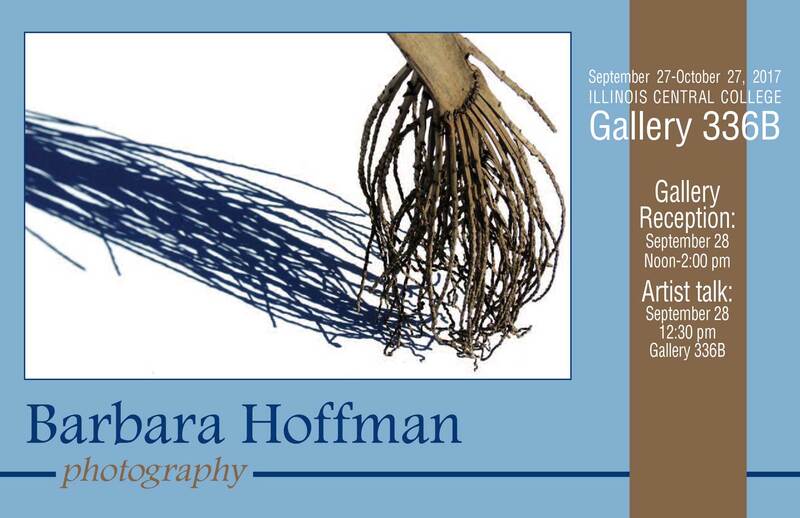 In addition, an exhibit by Barbara Hoffman opens September 27 in Gallery 336B, located in the Academic Building. A gallery reception will be held September 28 from noon to 2 pm, with a talk with the artist on that date beginning at 12:30 pm. Hoffman has been practicing the art of photography for more than 40 years. Her work has been featured in numerous exhibits across the country, including venues for the Florida Gulf Coast University in Fort Myers, the Lexington Art League in Kentucky, the Mighty Fine Arts in Texas, and Eastern New Mexico University in Las Cruces. In 2016, Hoffman completed a two-month residency at the Prairie Center for the Arts in Peoria. Her photography focuses on landscape and abstraction, but recently she has been expanding her work to include other media such as printmaking, drawing and painting with ink and watercolor. Her exhibit, One Thing Leads to Another, is about her journey as an artist and how she creates her work. She resides in Peoria. Claffey is an assistant professor of photography at Indiana University. She graduated with honors from Earlham College in Richmond, Ind. She holds a master of fine arts degree in photography from Texas Woman’s University in Denton, Tex., where she also earned a graduate certificate in women’s studies. She received a 2012-13 William J. Fulbright Fellowship, which she used to support her documentary and creative research in Eastern Europe. Claffey’s work focuses on how personal and family narratives are shaped by interactions with both domestic and institutional structures and spaces. Her work has been recognized by various galleries and publications including PDN Magazine, Project Basho Gallery, Abecedarian Gallery, The Eddie Adams Workshop, The Chronicle of Higher Education, The Dallas Morning News,and The Kinsey Institute. Her exhibit, Matrilinear, is an ongoing series that addresses embodied memory and its relationship to personal, familial and cultural identity. These images examine family folklore, ritual, and mnemonic objects passed down through generations of women. The photographs of each object reveal the physical remnants of a body long gone, including stains, tears and loose thread from clothing that were kept close to the body for comfort and protection. The photographic representations are both a visualization and an expansion of stories shared as family lore. Both ICC exhibits will be on display through noon on October 27. Hours of operation for Gallery 336B are Monday through Thursday, from 9 am to 5 pm and Friday from 9 am to noon. The Performing Arts Center Gallery is open Monday through Thursday from 9:30 am to 7:30 pm, and Friday from 9:30 am to noon. The Performing Arts Center Gallery also is accessible when the facility is open for public events. ​Operation of the galleries varies with ICC’s holidays and breaks. For more information or to confirm a gallery will be open at a particular time, visit the calendar of events in ArtsAtICC.com or call the ICC Arts and Behavioral Sciences Department at (309) 694-5113.